Come rain or storm, NSPA artists diligently put up performances at various places in the city. The best part about these performances is that they’re free. Yes, you don’t have to shell out even a penny to listen to our artists. All we ask of you is to give us a some of your time and attention. Here is a list of locations our artists will be performing at over the next few days. Head over to these venues to enjoy some wonderful live music performances and street plays too! Oberoi, Goregaon: The performance-art loving folks at Oberoi have created ‘Theater Thursdays’ and ‘Musical Fridays’ to make your weekdays fun days! Watch NSPA artists perform thought-provoking, witty street plays every Thursday, from 4-6 pm. Plus, to celebrate ‘Musical Fridays,’ NSPA artists will be putting up melodious performances from 4:30 – 7:30 pm. Head over to enjoy two days of fab, fab performances! 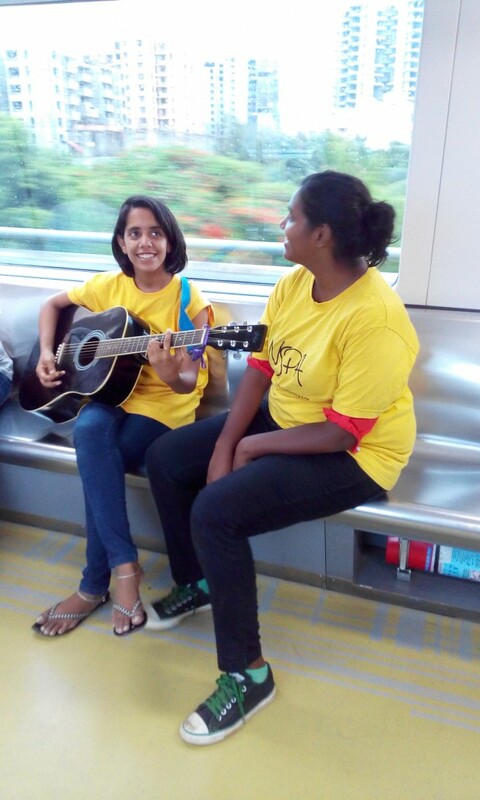 Mumbai Metro Stations: NSPA artists have become regular performers at Metro stations. The Mumbai Metro believes in making commuting comfortable and enjoyable and have always encouraged busking inside stations. On your way to or from work, you can always stop a while and immerse your senses in some melodious music. All you need to do is spot our artists (dressed in our trademark yellow tees) and stand next to them for a bit. This Saturday and Sunday, performances will be held at Marol Naka and Ghatkopar stations respectively, from 9-11 am and from 5-8 pm. Well, hope our initiative of taking art to the streets helps you have an enjoyable week and weekend!